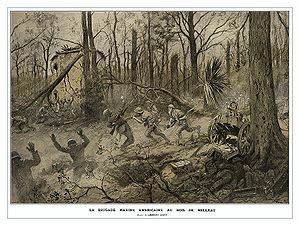 The Battle of Belleau Wood (1 June 1918 – 26 June 1918) occurred during the German 1918 Spring Offensive in World War I, near the Marne River in France. The battle was fought between the U.S. Second (under the command of Major General Omar Bundy) and Third Divisions and an assortment of German units including elements from the 237th, 10th, 197th, 87th, and 28th Divisions. In 1917, he assumed command of the 1st Brigade, 1st Expeditionary Division, and in June he sailed for France. As a division and corps commander during World War I, he participated in the occupation of the Toulon and Troyon Sectors near Saint-Mihiel, served in the Aisne-Marne operations, and took part in the occupations of Chateau-Thierry. Following the war, he commanded Fort Lee, Virginia, the 7th Corps Area, the Philippine Division, and the 5th Corps Area.